Lew Alcindor, LeBron James, Wilt Chamberlain head list of hardwood elite as prep standouts. 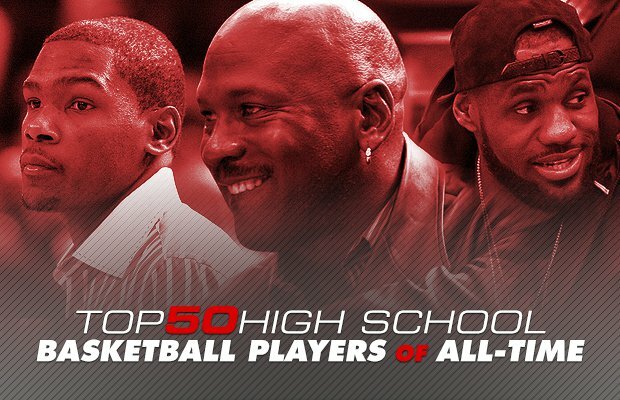 Lew Alcindor, LeBron James, Wilt Chamberlain and Oscar Robertson can all make strong arguments as the greatest high school basketball player, but only one can take the top spot on our list of the Top 50. Only players who were selected first-team All-American during their high school careers were considered. Selections were made and ranked based primarily on their high school careers with additional credence given to their college (when applicable) and professional careers. From Chamberlain, Robertson and Jerry West in the 1950s to modern day phenoms like Kevin Love and O.J. Mayo, let the debate begin. Although he later changed his name to Kareem Abdul-Jabbar, he was known as Alcindor throughout his days at Power Memorial and later at UCLA. He became the first player to earn Parade Magazine first team honors three years in a row. He led Power Memorial to three city championships and 71 straight wins. The team went 96-6 during his four seasons with only one loss after his freshman year. He finished his career as the No. 3 all-time leading scorer in New York history and the No. 1 player in PSAL history with 2,067 points. The 1964 Power Memorial team was ranked by a group of national writers in May of 2000 as the "No. 1 team of the century". Alcindor went on to win three NCAA titles at UCLA and six NBA titles (one with the Bucks, five with the Lakers) while finishing as the NBA's all-time leading scorers with 38,387 points. James was a three-time Parade All-American including first team as a junior and senior. He was also a three-time Mr. Basketball winner in Ohio while helping lead his team to three state titles in four years. As a senior, he led St. Vincent-St. Mary to the mythical national championship. The No. 1 overall pick in the 2003 NBA Draft, James has won three NBA titles, been named league MVP four times, been first team All-NBA 12 times and is a 14-time All-Star. He also ranks No. 5 all-time on the NBA scoring list. One of the first true 7-foot superstars in high school basketball, Chamberlain led Overbrook to a pair of city championships and a 56-3 career record. He broke the state record for scoring with 2,252 points — an average of 37.4 points per game. He also had games of 74, 78 and 90 points as a senior. A first team All-American by "Picture Week" (Parade did not select All-Americans until 1957), Chamberlain matriculated to Kansas, where he led the Jayhawks to the national championship game in 1958. He entered the NBA as a territorial pick of the Philadelphia Warriors and played 14 seasons in the NBA. He was a 13-time All-Star, a seven-time All-NBA first team pick and a four-time MVP. He also finished his career as the league's all-time leading scorer with 31,419 points. Robertson led Crispus Attucks to a 62-1 record over his final two seasons, winning a pair of state championships and 45 straight wins. He was Mr. Basketball in Indiana as a senior and was a Scholastic Coach All-American. He averaged 24 points per game his senior year. At Cincinnati, he established himself as one of the great college players of all-time as he led the NCAA in scoring three times, was consensus first team All-American three times and was College Player of the Year three times. He finished his career as the all-time leading scorer in NCAA history. In the NBA, Robertson was a 12-time All-Star, a nine-time All-NBA first team selection and the league's MVP in 1964. He finished his career with 26,710 points. He also won a gold medal with the 1960 Olympic Team. Bryant was a two-time state Player of the Year in Pennsylvania and finished his career as the all-time leading scorer in the southeast part of the state with 2,883 points. He led Lower Merion to a 31-3 record and a state championship as a senior, averaging 30.8 points and 12 rebounds while earning Parade Magazine All-American first team honors. He played 20 years in the NBA as a member of the Los Angeles Lakers, winning five NBA titles, playing in 18 All-Star games and being named All-NBA first team 11 times. He finished his career with 33,643 points, which is the third-most in NBA history. The first high school player to go directly to the professional ranks, Malone was a two-time Parade and Scholastic Coach All-American while leading Petersburg to a pair of Virginia state championships. He scored 2,124 points in high school and led his team to 50 straight wins. As an ABA and NBA player, Malone played 21 seasons and was named league MVP three times and played in 12 All-Star games. Johnson led Everett to the Michigan state championship his senior season, earning state Player of the Year honors and Parade Magazine national Player of the Year recognition. In two seasons at Michigan State, Johnson led the Spartans to an NCAA championship as a sophomore and earned consensus first team All-American honors. The No. 1 overall pick in the 1979 draft, Johnson led the Lakers to five NBA titles and was named league MVP three times. He also made the All-Star game 12 times and was a nine-time All-NBA first team selection. Lucas was twice named the national high school Player of the Year while leading his team to 76 straight wins and a pair of Ohio state championships. In college at Ohio State, Lucas was a three-time All-American and earned NCAA Player of the Year honors twice while leading the Buckeyes to three straight championship games, including an NCAA title in 1960. He played 13 seasons in the NBA and was an All-Star seven times and a first-team All-NBA selection three times. He also won an Olympic Gold medal with the 1960 team. Although he began his high school career in South Carolina, Garnett finished at Farragut in Illinois. He led Farragut to a 28-2 record his senior year and was USA Today Player of the Year as a senior. He averaged 25.2 points and 17.9 rebounds per game that year. He also earned Parade Magazine first team honors as a junior and senior and scored 2,553 points in his career. Garnett entered the NBA draft after his senior season and was chosen No. 5 overall. In a 21-year career, Garnett earned All-Star honors 15 times and was All-NBA first team four times. He was also the NBA's most valuable player in 2004. A four-time All-State player in West Virginia, West earned first team All-American honors from Scholastic Coach. He averaged 32.2 points per game as a senior while earning the state Player of the Year award. At West Virginia, West led his team to the NCAA finals in 1959 and was a two-time consensus first-team All-American. He played 15 seasons with the Lakers and was a 14-time All-Star and a 10-time All-NBA first team pick. He scored 25,192 points in his career. O'Neal led Cole to a 68-1 record over his final two seasons and won a state title in 1989. He was a first team Parade Magazine All-American after racking up a state record 791 rebounds. He was a two-time first-team All-American at LSU and was the NCAA Player of the Year in 1991. The No. 1 overall pick in the 1992 draft, O'Neal made 15 All-Star games and was All-NBA first team eight times in a 20-year career with six teams. The top recruited player in the Class of 1981, Ewing was a three-time Parade All-American while leading his team to three state titles. He had 1,763 career points and was 96-5 in four seasons. In college, he led Georgetown to the NCAA finals three times with a championship in 1984. He was a three-time consensus All-American. The No. 1 overall pick in the 1985 NBA Draft, Ewing played in 11 NBA All-Star Games in his career. Kidd ended Southern California's dominance in the state championships by winning two straight Division 1 championships. He was a two-time state Player of the Year by Cal-Hi Sports and was the national Player of the Year by Naismith, Parade and USA Today. He scored 2,621 points in his high school career. He was a consensus first-team All-American at California and was the No. 2 overall player selected in the 1994 NBA Draft. He was a 10-time NBA All-Star and made first-team All-NBA five times. Mourning made the Parade Magazine All-American team three times, including first team as a junior and senior. He was the USA Today Player of the Year as a senior when he averaged 25 points and 15 rebounds with 12 blocked shots. He made All-American three times in college at Georgetown, including first team as a junior. He was the No. 2 overall pick in the 1992 draft (behind Shaquille O'Neal) and he went on to play in seven NBA All-Star Games and was NBA Defensive Player of the Year twice. It may be an overstatement that Jordan was "unknown" heading into his senior season at Laney. Although he was not a preseason All-American by Street & Smith's, he was an early signee with North Carolina (he was not considered in early 1980 to be one of the Tar Heels' top recruits, however). Jordan had a spectacular senior season, however, earning Parade Magazine All-American honors and McDonald's All-American Game MVP honors. He led North Carolina to an NCAA championship as a freshman and was a two-time first-team All-American. The No. 3 overall pick in the 1984 Draft, Jordan was a 10-time scoring champion, made All-NBA first team 10 times and was a 14-time NBA All-Star while winning six NBA championships. He was also a five-time NBA Most Valuable Player. One of the greatest players to come out of Chicago, Thomas was a first-team Parade Magazine All-American. He played two seasons at Indiana, leading the Hoosiers to the NCAA championship in 1981 while earning first-team All-American honors. He left for the NBA after his sophomore season and was the No. 2 overall pick in the NBA Draft. He played 14 seasons in the NBA, winning two titles with the Detroit Pistons. He was a 12-time NBA All-Star and made All-NBA first team three times. One of the most dominant college players ever, Walton was a three-time NCAA Player of the Year while leading UCLA to a pair of national championships and an 88-game winning streak. He played high school basketball for the Highlanders and was a Parade Magazine All-American while leading his team to a pair of San Diego Section championships. Hampered by foot injuries in the NBA, Walton led the Trailblazers to an NBA title in 1977 and he helped the Boston Celtics win one in 1986. He was a two-time All-Star and was the NBA's Most Valuable Player in 1978. Twice a Parade Magazine All-American, including first team as a senior, Durant was the MVP of the 2006 McDonald's All-American Game. As a freshman at Texas, Durant was the National College Player of the Year. Drafted No. 2 overall in the 2007 NBA Draft, Durant is a nine-time NBA All-Star and has been first-team All-NBA six times. He is also a four-time NBA scoring champion. Hawkins earned All-City honors as a junior and senior while leading Boys to a pair of PSAL championships. He averaged 25.5 points his senior year and was a Parade Magazine All-American. He was involved in a point-shaving scandal while at Iowa and was expelled from the school even though he was never arrested or indicted. He did not play college basketball, but instead played in the American Basketball League and with the Harlem Globetrotters before finally getting a chance to play in the ABA in 1967. He played nine seasons in the ABA and NBA and was a five-time All-Star. Pistol Pete played at several different high schools due to his father coaching at several different colleges during his high school years. He finished at Broughton (Raleigh, N.C.) where he was a Parade Magazine All-American. After one season at Edwards Military Institute, where he averaged 33 points per game, Maravich went to LSU and led the NCAA in scoring three times and was a two-time NCAA Player of the Year. He is still the NCAA Division I all-time leading scorer with 3,667 points. He played 10 seasons in the NBA and was a five-time All-Star. Bradley finished his high school career as the Missouri all-time leading scorer with 3,068 points. A two-time Parade Magazine All-American, Bradley went on to play at Princeton, where he was a two-time first-team All-American and the college Player of the Year in 1965. He played 13 seasons in the NBA and was an All-Star in 1973. He later embarked on an 18-year career as a United States Senator. Webber was a two-time Parade Magazine first-team All-American and was the national Player of the Year in 1991 while averaging 29.4 points and 13 rebounds. In two seasons at Michigan, he led the Wolverines to the NCAA title game twice and was a first-team All-American as a sophomore. He was the first overall pick in the 1993 NBA Draft and played 15 seasons in the NBA. He is a five-time All-Star and was first-team All-NBA in 2001. One of the most prized recruits in a star-studded 1979 high school class, Sampson was a first-team Parade Magazine All-American before heading to Virginia. There, he was a three-time ACC Player of the Year and a three-time first-team All-American. The No. 1 overall pick in the 1983 draft, Sampson played in four NBA All-Star Games before injuries slowed down his career that lasted eight seasons. Cartwright was a three-time Parade Magazine All-American, earning first-team honors as a junior and senior. He went to University of San Francisco, where he's the school's all-time leading scorer. He was the No. 3 overall pick in the 1979 NBA Draft and played 16 years in the league. He was an All-Star in 1980 and won three NBA titles with the Bulls. Relatively unknown while playing in Florida his first three seasons in high school, McGrady transferred to Mount Zion Christian Academy and was the National Player of the Year by USA Today. Drafted No. 9 overall by the Raptors in 1997, McGrady played 16 seasons in the NBA, was a seven-time All-Star and a two-time All-NBA first team selection. He also led the NBA in scoring in 2003 and 2004. A two-time Scholastic Coach All-American and a Parade Magazine All-American, Worthy averaged 21.5 points and 12.5 rebounds as a senior. He helped lead North Carolina to an NCAA title in 1982 while earning first-team All-American honors. He was the first player chosen in the 1982 draft and played 13 years for the Lakers. He was a member of three NBA championship teams and a seven-time All-Star. An All-State player in two states, Manning was All-State in North Carolina after leading Page to a 26-0 record and a state title. He moved to Lawrence (Kan.) and was the state Player of the Year in 1984 and a first-team Parade Magazine All-American. He led Kansas to an NCAA title his senior year and was a two-time first-team All-American. He was the No. 1 overall pick in the 1988 draft and played 15 seasons with seven teams and made two All-Star games. After leading Southwest Atlanta Christian Academy to a state title in 2004, Howard won nearly every national Player of the Year award imaginable, including Naismith, Gatorade, Morgan Wootten and McDonald's. He averaged 25 points, 18 rebounds and 8.1 blocks during his senior year. He was the No. 1 overall pick in the 2004 NBA draft and has played 15 years in the NBA. He is an eight-time All-Star and a five-time All-NBA first team pick. He has also been the NBA Defensive Player of the Year three times. Anderson was a three-time All-State first team selection by the New York Sports Writers Association and concluded his career as New York's all-time leading scorer with 2,621 points. He also made Parade Magazine All-American first team twice and was second team as a sophomore. Gatorade also named him the national Player of the Year. At Georgia Tech, Anderson earned first team All-America honors. He was the No. 2 overall pick in the 1991 NBA draft and played 15 seasons in the NBA. He played in one All-Star game. Wilkins was the less heralded player coming out of North Carolina in 1979, rated behind two-time All-American James Worthy. Wilkins was no-less spectacular though, as he earned Parade Magazine first team All-American honors as a senior. He once posted 48 points, 27 rebounds, nine dunks and eight blocks to register a spot in Sports Illustrated's "Faces in the Crowd" article. He played at Georgia and was second team All-American as a junior. The No. 3 overall player chosen in the 1982 NBA Draft, he played 16 seasons in the NBA and was a nine-time All-Star. He scored 26,668 points in his career. A state Player of the Year in Maryland as a junior at Towson Catholic, Anthony played at Oak Hill Academy as a senior and earned Parade Magazine All-American first team honors. He played one season at Syracuse and led the Orangemen to an NCAA championship. He was the No. 3 overall pick in the 2003 NBA Draft and has gone on to appear in 10 All-Star games in 16 seasons. Carter led Mainland to a state championship as a senior and was a McDonald's and Parade Magazine All-American. He was a second-team All-American while playing at North Carolina and was the No. 5 overall pick in the 1998 NBA Draft. He has played 20 seasons in the NBA with eight teams and is an eight-time NBA All-Star. Murphy was an All-State pick three times and a two-time All-American while at Norwalk, scoring 2,192 career points. At Niagara, Murphy was All-American three times and scored 2,548 points in his four-year career. At 5-foot-9, Murphy is considered one of the best "small" men in NBA history. He played 14 years in the league, all for the Houston Rockets, and finished with 17,949 points. The first-ever four-year starter at DeMatha, Dantley was a three-time all-section selection and a first team Parade All-American. He was a two-time first team All-American at Notre Dame and finished his career as the school's second all-time leading scorer with 2,223 points. Also a member of the 1976 gold medal-winning Olympic Team, Dantley was the No. 6 overall pick in the 1976 draft. He played 15 seasons in the NBA and was a six-time All-Star while leading the league in scoring twice. He finished his career with 23,177 points. Iverson was the state Player of the Year in football and basketball while leading Bethel to state championships in both sports during his junior year. He did not play sports his senior year due to a rioting incident at a bowling alley in 1993. After charges were dropped in the incident, Iverson went to Georgetown and was a first-team All-American in 1996. He was the No. 1 overall pick in the 1996 NBA Draft and went on to a 15-year NBA career. He was an 11-time All-Star and a three-time first-team All-NBA choice while earning MVP honors in 2001. He scored 24,368 points in his career. The all-time Oregon leading scorer, Love scored 2,628 points while earning state Player of the Year honors three years in a row. He led Lake Oswego to the state finals three straight seasons, winning it all during his junior season in 2006. He was the Gatorade Male National Athlete of the Year and a Parade first team All-American. In his one season at UCLA, he was named the Pac-10 Player of the Year and was a consensus first team All-American. The No. 5 overall pick in the 2008 NBA Draft, Love has made the NBA All-star game five times. A member of the College Basketball Hall of Fame and the Basketball Hall of Fame, Parish played 21 seasons in the NBA with four teams. He was the eighth overall pick in the 1976 NBA draft and he went on to win four NBA titles and play in nine All-Star Games. At Centennary, Parish was a second team All-American as a senior. He ranks as one of the all-time leading scorers in Louisiana High School history with 3,562 points. He was a Parade First Team All-American as a senior. A three-time Parade All-American, Rose made the second team as a sophomore, third team as a junior and first team as a senior. He was also a McDonald's All-American and was named Mr. Basketball in Illinois. He played one season at the University of Memphis, where he was a third-team All-American. The No. 1 overall pick in the 2008 NBA Draft, Rose was the Rookie of the Year in 2009 and the NBA Most Valuable Player in 2011. He is a three-time All-Star. As a senior, Paul averaged 30.8 points per game and was named Mr. Basketball in North Carolina by the Charlotte Observer. He also earned Parade Magazine First Team All-American honors and was a McDonald's All-Star. A consensus first team All-American at Wake Forest as a sophomore, he was the No. 4 overall pick in the 2005 NBA draft and has made the All-Star game nine times while earning first team All-NBA honors four times. Stackhouse began his high school career in North Carolina, leading Kinston to a state championship and earning state Player of the Year honors. As a junior and senior, Stackhouse played at Oak Hill Academy and earned Parade Magazine All-American first team honors both seasons. The 1993 team at Oak Hill Academy is considered one of the greatest in high school history, as it finished 36-0 with a No. 1 national ranking. Stackhouse played two seasons at North Carolina, winning NCAA Player of the Year honors as a sophomore. He was the No. 3 overall pick in the 1995 draft and he spent 18 seasons in the NBA with eight teams. He made the NBA All-Star game two times. At the time he graduated, Unseld was considered the best big man ever produced by the state of Kentucky. He led Seneca to a pair of state titles and twice earned All-State honors. He averaged 24.5 points per game as a senior and had 1,289 points in his career. He made the Parade Magazine All-America first team. At Louisville, Unseld twice earned consensus All-American first team honors. As the No. 2 overall pick in the 1968 NBA Draft, Unseld went on to become the only player to earn NBA MVP and Rookie of the Year honors in the same season. He was a five-time NBA All-Star and played 13 seasons for the Washington Bullets. He was a member of the NBA 50th Anniversary All-Time Team. A two-time first team All-American by Parade Magazine, Wallace was named the National Player of the Year by USA Today in 1993. He helped lead North Carolina to the Final Four in 1995, but left college for the NBA after his sophomore season. There, he was the No. 4 overall pick in the 1995 NBA draft and played in four NBA All-Star games. Buckner played on championship teams at four different levels. At Thornridge (Dolton), Buckner led the team to back-to-back state championships, including a 1972 season in which the team did not lose a game. That team is considered one the greatest in Illinois history. Parade Magazine selected him to the All-America team twice, including the first team as a senior. At the University of Indiana, Buckner played on the 1976 team that won the NCAA championship and is the last college team to finish the season undefeated. He also played on the 1976 Olympic team that won the Gold Medal in Montreal. In 10 seasons in the NBA with three different teams, Buckner won an NBA title as a member of the 1984 Boston Celtics. Bibby ranks as likely the best player to come out of Arizona as he led the Matadors to a state championship in his senior year and finished his career as the state's all-time scoring leader (now No. 2) with 3,002 career points. As a freshman at University of Arizona, he helped lead the Wildcats to an NCAA championship and as a sophomore he won Pac-10 Player of the Year and consensus All-American honors. He was the No. 2 overall pick in the 1998 NBA Draft and he played 14 seasons in the NBA with six teams before returning to his alma mater as coach. Finished his career as the all-time leading scorer in New York state history with 2,785 points. He was a three-time first team All-State selection by the New York Sports Writers Association and made the Parade All-American Team twice, including first team as a senior. He was also USA Today First Team All-America as a senior. He was the No. 13 overall pick in the 2004 NBA Draft and played 10 years in the NBA with eight teams. Mayo had a nomadic high school career, playing at three schools in three states and earning All-State honors at all locations. He played in Kentucky as a seventh- and eighth-grader, averaging 23.1 and 20.5 points per game respectively. He was All-State by the Louisville Courier-Journal as an eighth-grader. He then moved to Ohio and played at North College Hill for his first three years in high school. He scored 2,033 points at NCH and led the team to a pair of state championships. He was also the state Player of the Year as a sophomore and junior. For his senior season, Mayo went back home to play at Huntington and led the team to a state championship while earning EA Sports Player of the Year honors and averaging 28 points per game. He was a three-time USA Today All-American and a three-time Parade Magazine All-American. After one year a USC, Mayo played nine seasons in the NBA with three different teams before being banned from the league due to a drug violation. After leading Lincoln to the state tournament in 2001, Bosh helped his team win the Class 4A state championship and claim the No. 1 ranking in the nation for the 2002 season. Bosh was Class 4A state Player of the Year and All-America by Parade, McDonald's and EA Sports. After one season with at Georgia Tech, he was the No. 4 overall pick in the 2003 NBA Draft. He played 14 seasons in the NBA, winning two championships and earning All-Star honors 11 times. Although injuries severely limited his professional career, Oden dominated at the prep and college level. In his final three seasons at Lawrence North, he led the team to three straight Class 4A state titles. He was a three-time Parade Magazine All-American, including first team as a junior and senior. He was also a two-time Gatorade State Player of the Year and the National Player of the Year as a junior. In college, he helped lead Ohio State to the NCAA finals and was a second team All-American. He was the No. 1 overall pick in the 2007 NBA Draft, but played just 105 games in a six-year career due to injuries. Ranked as the No. 1 player in the country by Parade Magazine in 1976, Griffiths was offered over $30 million to turn pro in the ABA, according to one report. Instead, he went to Louisville and led the Cardinals to the NCAA championship in 1980 while earning All-American honors. He finished his career as the school's all-time leading scorer with 2,333 points. While at Male, he led the team to the state championship as a junior and averaged 24.1 points per game as a senior. He averaged 21.4 points in his three years on the varsity. He played 12 seasons in the NBA, all as a member of the Utah Jazz. He was the 1981 Rookie of the Year and at one time he held the NBA career record for most three-point field goals made. Owens finished his career at Carlisle as the state's second all-time (now third) with 3,299 points. He led Carlisle to four state championships and averaged 25.5 points per game over 129 games. He had 53 points in his final game while leading Carlisle to a 33-0 record. He twice made the Parade All-American Team. He played three seasons at Syracuse and was the Big East Player of the Year as a senior. He was the No. 3 overall pick in the 1991 NBA Draft and he played 11 seasons in the NBA with seven teams.